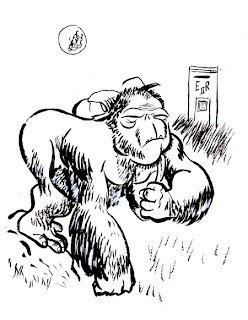 The Ape of Anglesey (or TAoA to the residents (incidentally, "tao-a" is how the locals describe the primate's call of alarm) of the island) is famous for delivering the midnight post. The first reported mention comes from 1835. Local farmer, Bedwyn Davies, forgot twice during a Tuesday in May to get an urgent letter into the village post box before both the early and late post deadlines. Thinking, "later is better than never," he mailed the letter after the second post collection. To his surprise, he received a response to his urgent letter in the late Wednesday post. Weighing his previous experience with the chronically tardy postal delivery to this incident of rapid response meant only one thing to Davies: Someone or something was collecting the midnight post! 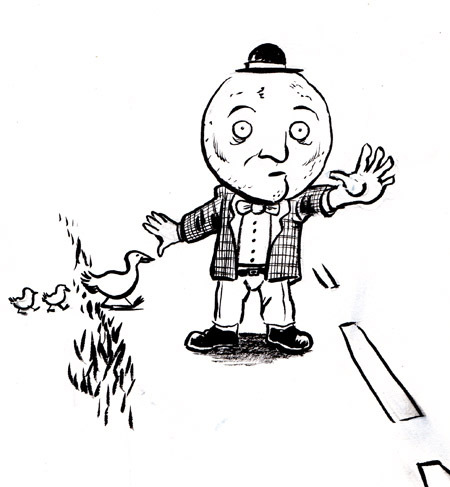 Davies quickly spread word to all the other villagers about the fishy postal delivery and before long, the village of Pentraeth were on alert for signs of the phantom midnight postman. One cool autumnal night, Galdagwynn Jones, local farmer to Pentraeth, was stumbling home over the hills after a late night in the local pub when he spied a strange figure loping on the horizon with what looked to be a post-bag. 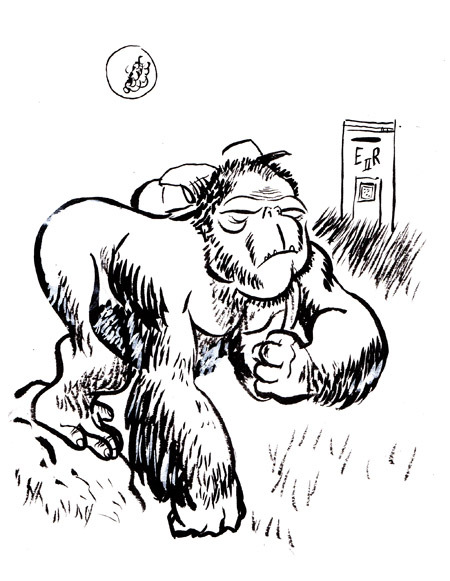 The next day, Jones delivered a description of the strange postman to his local police. From his summary, they were able to execute a sketch: a large primate! Through the years, more and more sightings and late post collections have cemented the Ape of Anglesey into the local cannon of strange occurrences. Few mythical figures can successfully compare their compassion or consideration to the Lake District's Dairy-headed Do-Gooder. The Cheeseman won't be found in the darkest of forests preying on little children, or hiding under beds waiting for ankles to nibble. No, the Cheeseman will be found reaching down tins of tomatoes far too high for pensioners, or escorting mother and ducklings across busy roads, or calling middle aged men in order to remind them of their partner's fast-approaching birthday. No one knows just where the Cheeseman came from, but everyone hopes he sticks around for a long time. Come the first signs of Spring, Cumbrian children participate in a local custom: they leave boxes of starch on their windowsills for the Cheeseman (it's said that the Cheeseman is keen on keeping his collars crisp). 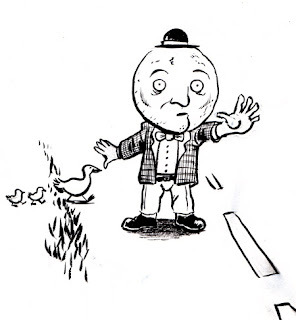 So goes the nursery rhyme every child in Dorking sings on warm summer nights. 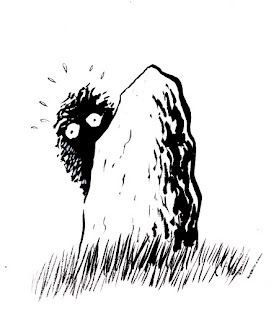 Since the middle ages, local Dorking lore has contained tales of the Dread of Dorking. No one has ever seen the Dread, but many Dorking residents have felt the cold sweats of something lurking the the forest surrounding the ancient market town. Some say the Dread is the soul of a thief, hounded by the infamous 11th century sheriff, Galhud Strangesoup. Others believe the Dread to be the living embodiment of cowardice. One anecdote tells the tale of an overzealous enlistment officer who during WWI traveled from London to Dorking to roust out young men who refused to fight. The story goes that the enlistment officer cut through the woods instead of taking the busy market road in order to catch the young men unawares. While deep in the woods, the officer felt the panic of something nearby. He hollered out to the fearful thing, and demanded it show itself. Thinking the Dread was a conscientious objector, he chased the Dread all through the forest for a week, refusing to give up his quest. One night, the town was woken by the raving enlistment officer, who was seen running down the main thoroughfare wearing nothing but pine needles and a live badger. Some say the Dread is responsible for the salvation of many young would-be soldiers. Wildly popular to Victorian tourists, the mention of the Pennines Polecat would conjure up violent tremors of fear in the hearts of young children. In its heyday, the Polecat was said to be responsible for the Bowland Fringe Massacre of 1868, the Lady Deaths of the Dark Peak, and the Boer War. 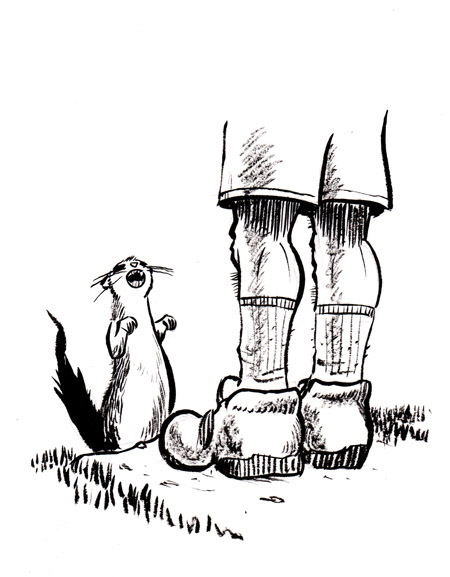 The Polecat was said to appear out of thin air and that his howl could bring grown men to their knees. Sir Robert Peel even sent the Prince of Wales Regiment to assassinate the varmint and bring the pelt back for the dressmakers of Queen Victoria. Sadly, the regiment never returned. Mention of the Polecat dropped off considerably after the advent of the snapshot camera. Now, few children have even heard of the Devil Polecat, let alone tremble in pools of their own urine.